In a recent blog, we pointed out some of the top reasons why summer is the season for car accidents – and one of those reasons was that the heat of summer increases the risk of vehicle equipment malfunctions. In fact, your vehicle’s tires are especially vulnerable to the summer heat, especially if they are worn down and/or about five year old (or older). So, to help you reduce your risk of experiencing a summertime car accident related to an equipment malfunction, below, we’ll point out what you can do minimize your risk of a tire blowout. 1 – Check your tires’ air pressure. 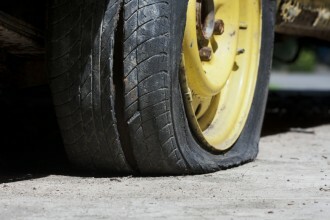 Taking care of your vehicle’s tires can be key to avoiding a blowout and a summer car accident, an experienced Littleton car accident lawyer explains. Underinflated tires are far more likely to blow out than tires with the proper air pressure. So, check the manufacturer’s suggested air pressure for your vehicle’s tires, and make sure your tires are inflated to this pressure. It’s also a good idea to get into the habit of checking your tire’s air pressure on a regular basis (like weekly if you drive a lot). 2 – Avoid overloading your vehicle. Overloaded vehicles add extra stress on your vehicle’s tires, which can increase the risk of blowouts. So, try not to force your vehicle to carry more weight than is necessary this summer if you really want to avoid a blowout and possible accident. This means driving the speed limit, avoiding potholes or obstacles in the road and slowly accelerating/applying the brakes when driving. The more aggressively you drive your vehicle, the more stress you will put on your tires. This, in turn, will increase the chances of blowouts, especially on warmer days. 4 – Rotate your tires & replace them if necessary. If your tires are still relatively new (less than 3 years old) and have sufficient tread on them, then get your tires rotated this summer. This can help them wear more evenly, and it can also reduce your risk of a blowout. If, however, your tires are worn down, older and/or lack tread, it may be time to get them replaced. Although you may not have budgeted for such a fix, investing in new tires may help you avoid a summertime car accident – and having that peace of mind as you travel this summer can be invaluable. Have you been hurt in a car accident caused by defective vehicle equipment or any type of negligence? If so, it’s time to contact an experienced Littleton car accident lawyer at Bahr, Kreidle & Flicker. Our lawyers know how serious and devastating the impacts of car accident can be, and we know that many injured people depend on settlements to get the medical treatments they need. That’s why we are committed to advocating injured people’s rights and helping them get them the highest possible awards for their injuries and losses.